An iceberg has broken off a glacier in Antarctica and could survive long enough to drift into international shipping lanes. 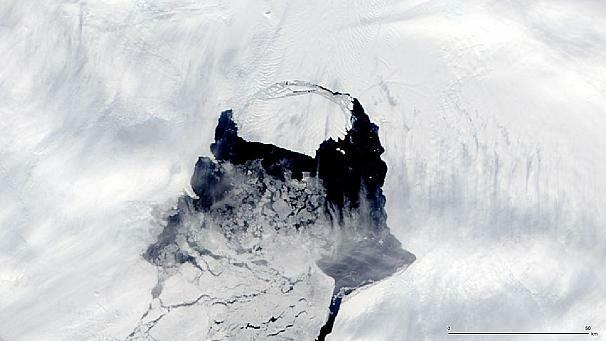 The iceberg is huge – roughly 700 square kilometres, about the size of Singapore, NASA reports. Experts say the iceberg could divide while drifting in the ocean and threaten the southern sea lanes used by cargo ships. “An iceberg that size could survive for a year or longer and it could drift a long way north in that time and end up in the vicinity of world shipping lanes in the Southern Ocean,” said Dr Robert Marsh, from the University of Southampton. “There’s a lot of activity to and from the Antarctic Peninsula, and ships could potentially cross paths with this large iceberg, although it would be an unusual coincidence,” he said. The British team’s work will help track this iceberg and more to come, as global warming encourages an increased amount. This entry was posted in Shipping and tagged Antarctic Peninsula, Antarctica, Iceberg, NASA, Pine Island Glacier, Sea lane, Singapore, Southern Ocean, University of Southampton. Bookmark the permalink.